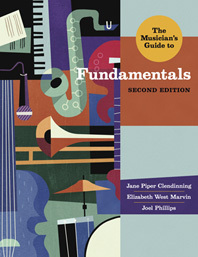 Visit the showcase site for The Musician's Guide to Fundamentals. A hands-on approach to mastering the basics in class and online. The Musician’s Guide to Fundamentals teaches the basics of music—listening, writing, and performing—using real music, from Bach to the Beatles, Broadway to the Black-Eyed Peas. A unique hands-on approach invites students to listen to music from day one as they learn to interpret musical notation and, eventually, to use it to compose songs of their own. New online resources—including an ebook, online notation from Noteflight, and quizzes—offer opportunities to listen, read, and turn in assignments online. Every chapter begins with listening to music—fundamental concepts follow, once students are engaged. Writing exercises throughout the text offer ample opportunities to practice writing. Finally, new Apply It activities, as well as ear-training assignments in every chapter, introduce students to practical musicianship. Every chapter features opportunities for in-class or at-home performance. Total Access gives students powerful new tools to develop their skills with every new book. An interactive ebook allows students to read, listen to musical examples, take notes, and access online exercises, all at the click of a mouse. Online recordings feature performances by students and faculty at the Eastman School of Music. Noteflight, an intuitive, cloud-based notation program, allows students to complete, listen to, and turn in assignments online, as well as to compose their own music. Total Access also includes online quizzes (with instant feedback) and an online virtual keyboard and guitar that students can use to find notes, scales, and chords anytime, anywhere. The Musician’s Guide to Fundamentals engages students with an eclectic repertoire of real music—from Bach to the Beatles, Broadway to the Black-Eyed Peas. Every chapter starts with music, and end-of-chapter “Did You Know?” boxes introduce the performers and composers behind the music. The Second Edition features a wider variety of popular music excerpts, including excerpts from songs by the Beatles, the Black-Eyed Peas, U2, Johnny Cash, Elvis Presley, Green Day, Billy Joel, Elton John, the Moody Blues, Whitney Houston, Taylor Swift, Stevie Wonder, and many more. A concise anthology of complete works—with online recordings—provides opportunities for further listening and practical application. Throughout every chapter, Key Concept and Summary boxes highlight and summarize essential information. Self-grading Try It exercises within each chapter give students the tools they need to assess their own learning. Another Way boxes offer alternative explanations for important ideas, recognizing that students learn in a variety of ways.